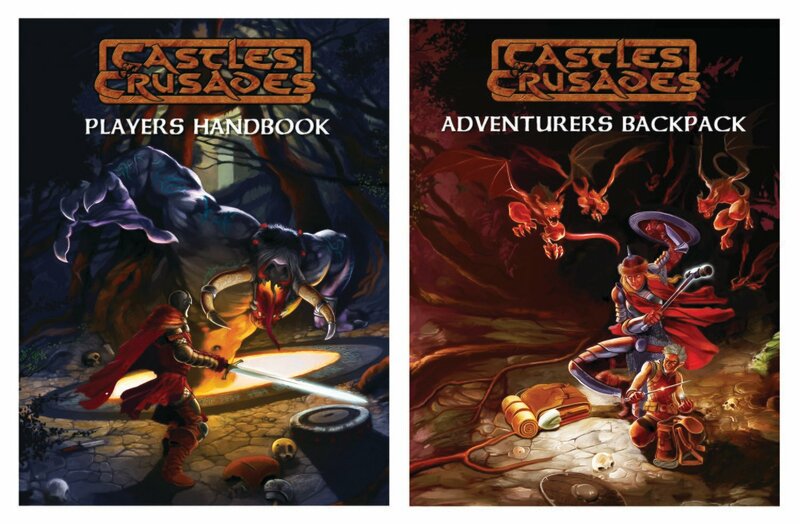 The Players Handbook and Adventurers Backpack together supply you with everything you need to get started in the table top world of Castles & Crusades, the rules lite, easy to learn and fast RPG! Between the two books are over 27 characters classes, rules of play, hundreds of spells, half a dozen racial options, equipment, streamlined backpacks and so very much more. From mounts to encumbrance, from fist fighting to turning the undead, these two books have it all covered. Get them separately (see below) or order together and save! About Castles & Crusades: A rules light adaptable table top role playing game that has stood the test of time. With an easy to play attribute check rules system, you'll be playing in minutes. This is the role players role playing game. 14 years in continuous publication! About The Players Handbook: It's easy to learn attribute-based rules system allows players to choose among 13 archetypal character classes and 7 races to with which create their characters. Spells, equipment, fast-paced combat rules, and all essential information needed to play a game of Castles & Crusades are in this book. About Adventurers Backpack: Adventurers Backpack brings to the table 13 new classes, mountains of spells for all classes, counter spells and spell duels, a fresh easy-to-use approach to unarmed combat, war mounts, rune magic, and a new look at pole arms. But more than that, Adventurers Backpack delivers a new, innovative approach to equipment and equipping your character. There are 34 unique backpacks complete with all the equipment your character will need!